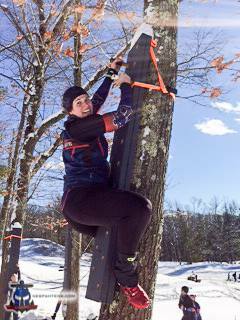 This was my first winter/snow OCR and I wasn’t completely sure how to dress, so I decided it was better to bring more layers than I may need and adjust as the race went on. As things turned out, Mother Nature was a good sport and provided an amazing day for this event, the temperatures ranged from the start (11:00 AM) to the end (4:30 PM) from about 36 °F to 34 °F. The area also had a snow storm only a day earlier, which dropped about three to four inches of fresh snow on the course which made for some nice soft snow and more of a challenge. The course started out with a nice trail run on freshly dropped snow. The course had a few spots that were extremely icy/slippery and it was a challenge to not fall going both up and down hills. The staff and volunteers all did an amazing job in these areas to warn each runner to be very careful. Even with my studded Icebug SPEED BUGrip’s I found myself almost falling a few times, but I managed to stay on my feet the entire day for both laps. 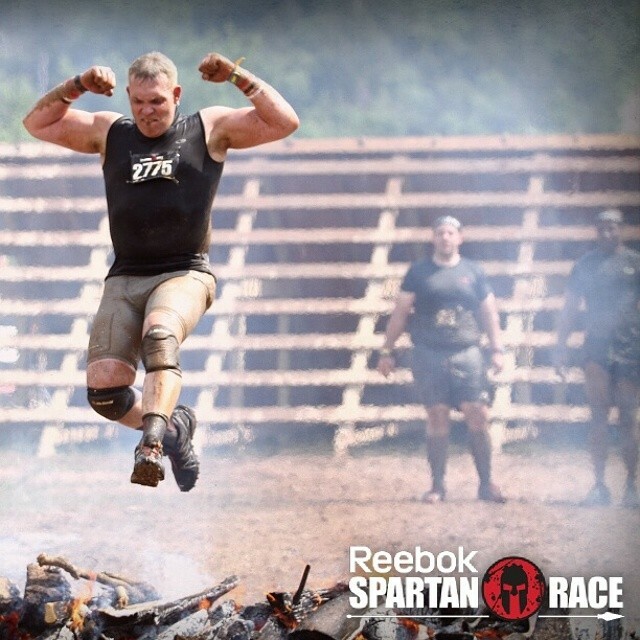 I am not going detail every obstacle the course had but will talk about the fun and/or interesting/challenging ones. 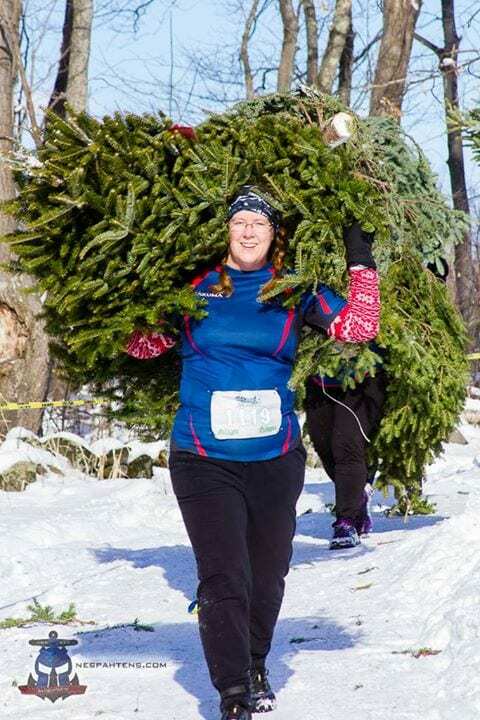 The first obstacle was a Christmas tree obstacle that had you run in between Christmas trees that were arranged to herd each runner though a very short course. One of the next obstacles was a fun “snow sled” that had us get some pretty good speed. I personally could have stayed on this part of the course, all day and done the sled a couple of hundred times! 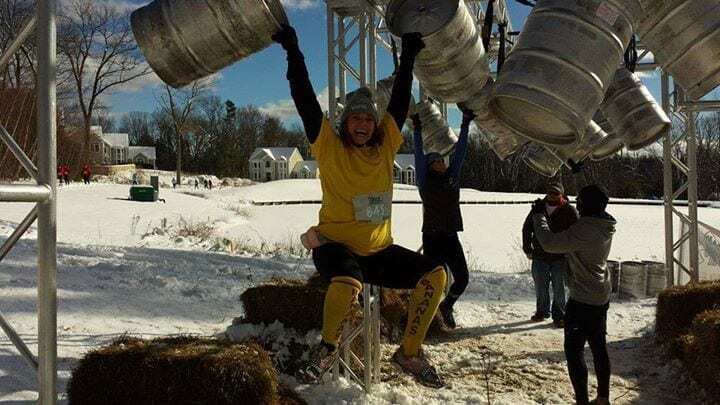 One of the coolest obstacles Blizzard Blast has and something that is a signature obstacle of theirs is the “Keg Kingdom” (see photo) which starts with several hanging beer kegs that require you to monkey climb from one keg to the next. After the first series of keg’s you then have to cross a set of monkey bars which Fred Smith (the race director) devilishly had installed on its sides so the bars were not your typical ones and had some that were not straight but rather angled and made it more of a challenge to complete that section of this obstacle. After the monkey bars, there was another set of hanging kegs. This is a very unique obstacle and to date I have not seen anything similar or as creative. Just after the wall climb came the next challenging and (at least for me) unique to OCR obstacle called “Peg it”. This obstacle required you to hold two well built wooden pegs (one in each hand) and climb a wall (attached to trees) using the peg holes and pegs. The technique I used and saw most others using on this obstacle was to wrap our legs around the tree so we weren’t relying just on upper body strength. I have to be honest, today (the day after) my inner thighs are both tender and sore from using this technique both times I successfully scaled the peg wall with no help. This obstacle was a great team work obstacle as I witnessed multiple groups working together to get each other to the top of the plank wall and back down safely. A unique obstacle was a mini keg lift. The best way to describe this obstacle is that it is similar to the Spartan Herculean hoist, but instead of using heavy sand bags they used a mini keg that was much lighter. The twist on this version is you have to use your wrists to spool the rope and lift the keg to the top of the hoist. The “cinder blocks walk” required you to use two cinder blocks to travel thirteen feet without your feet touching the ground. You would step on one block and move the next block in front of you, you then had to step over to the next block and repeat the process and move the other block again until you covered the entire thirteen feet. A took a few different techniques to find the best way to traverse this obstacle! The last challenging obstacle was the “Christmas tree carry”, which racers either carry or drag a large and still almost alive Christmas tree a decent distance. I carried the tree over my shoulders for both laps and I personally think that was a smarter technique than dragging the tree and used less energy. Other obstacles on the course that deserve an honorable mention are, a “football toss” which I found some humor in with “deflate gate” being a big deal right now both in the NFL and New England area, a paintball shooting obstacle, and a crawl that used Christmas lights in place of barbed wire. Local to the New England, or Tri-State region? I suggest participating in the #Racelocal Grand Prix, this is a movement/promotion that is being put on by the New England Spahtens but anyone in the area are welcome to pay the participation fee and enjoy all the great prizes/rewards for participating in #Racelocal events/races. Read all about it and don't miss out on the chance to enjoy some of the very best OCR's the New England area has to offer. I had a great time and it’s only fitting that the word Blast is part of this OCR’s name as that is exactly what I had, a blast. Fred, Robb McCoy (who assisted Fred with this even), the Blizzard Blast staff and volunteers all did an amazing job with building a great course and putting on an awesome event. I can think of only one other suggestion I have made to Fred for next year, the bag check should have both a pick up and drop off location that is different from each other to help shorten the overall lines during the mid-day waves. I am grateful I went to Blizzard Blast, as it was my first cold weather race and I learned a lot for future events. 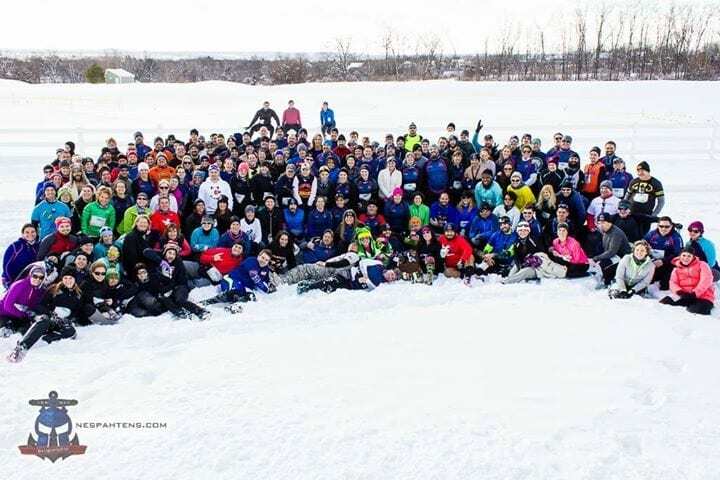 I cannot go without mentioning the New England Spahtens who had over two hundred and eighty members show up and race at Blizzard Blast. The schwag included one of the coolest finisher medals I have received to date, an official Blizzard Blast long sleeve shirt, a complimentary bowl of chowder, chicken noodle soup, or chili (the chili was yummy), and a very cool Blizzard Blast head buff. In addition, at the finish line multiple sponsors offered cool products such as Power Crunch bars, and Hint flavored water, while other sponsors had booths on site as well. I am going to rate this event 4.9 stars out of 5. The course used the terrain and snow to its fullest potential and all of the staff, including Fred and Robb made sure to warn the racers that parts of the course were very icy/slippery and to use caution. I enjoyed the time I got to spend talking to both Fred and Robb as they clearly are good friends who work well together and put on an awesome event from start to finish. As always, I want to thank both MRG and Blizzard Blast for such an awesome day! 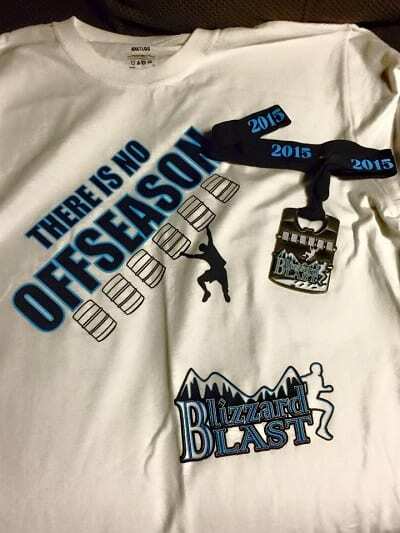 I look forward to running Blizzard Blast next year for sure and hope to see some of our MRG readers do the same. Have you done Blizzard Blast before? Share and rate your own experience.